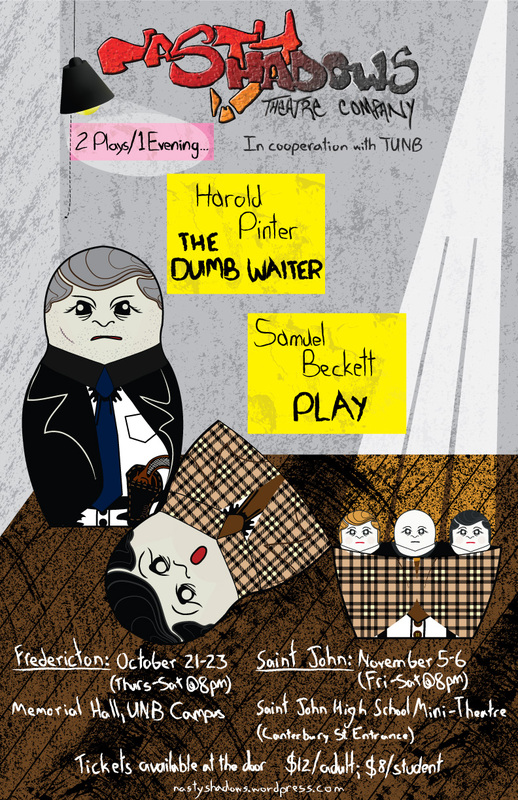 Dumb Play | Nasty Shadows Theatre Co.
One month later, the shows are over, and still Beckett haunts me – I just ran the lines again and they are all still in my head with no signs of lapsing. The SJ run went *very* well. We had a decent size crowd each night, and everyone seemed quite receptive to the shows – slightly shocked by Play, I think, and bewildered by The Dumb Waiter a bit, but nonetheless captivated and impressed. In retrospect, it was quite a head-trip doing these shows, with the dismal aspects of Beckett’s Play really having weighed on my soul – let’s just say I’m the all the more cheerier now for having stepped away from these pieces (HA!). That said, I certainly learned *tons*, which has been a benefit in my own attempts at writing as we prepare an original work for our spring production. And so, Michael and I just got back from Saint John. We got the lights set for The Dumb Waiter look, and we found a solution to the single light we need for Play that I think will work – Michael didn’t seem *overly* happy, but I think he’s game to try working with the follow-spot! HA! It’s pretty oppressive against the one getting hit by the beam as well though … so it’s not ideal by any means but a functional “on the road” solution. Tomorrow we load up the truck with our set pieces from Memorial Hall and we’re off to SJ. We need to run Play and work the cues. We should hopefully have success using either my Dad’s, or Nick’s Dad’s walkie talkies for Michael and Matt to communicate between the booth (where Matt will sit to call the cues) to the back of the house (where Michael is manually working the light) for the cues, but we gotta give this a test drive and the play is short enough to simply run the whole thing … which will be a good warm-up for the three of us for the performance later in the evening. Then we set up for The Dumb Waiter and run the cues. I am hoping Nicholas, from the SJHS tech crew, will be able to manage running the dumb waiter apparatus within the context of hitting the cues. I think it should work out okay, and it will be a good experience for and use of his presence. Tonight he rocked in the space though with getting us set up, so props to him for sure, and it also gives me confidence in his working the dumb waiter. We didn’t rehearse this evening, but ran the shows Mon-Wed this week and things are feeling good, although in that in-between stage where you now *know* what it feels like to have an audience and so not having one certainly makes a difference – you really notice the lack of their energy in the room. But, you gotta keep things sharp and the only way to do it is to run, run, run … it just feels more like going through the motions because you are just waiting for the audience again. We did do some great fine-tuning on The Dumb Waiter, I think, which was kinda cool to do and then get to put it up in front of a crowd again. Play has become the loose-musical-jamming-word-torrent, and I am really liking the sound of it, which is what I have focused on most from a director`s perspective because the visual is really set in stone – I do wish I could sit and watch the performance from the outside because I think it must be a unique experience. But being part of the driving force in the performance of that experience is certainly quite a rush too. To sum it up at this point: VERY HAPPY we did these shows at this time – everything went beautifully, I think, for the Fredericton run and while we took it easy this past week with only a single rehearsal, we will be jumping back into the thick of things come Monday with a busy week ahead culminating in the run in Saint John. The Dumb Waiter played out very nicely on the Memorial Hall stage with the set we used, and the guys just did a real admirable job of an extremely BRITISH text – their pace was perfect and the ordinary showed through in a performance quality that allowed the text to speak more for itself as the guys carried it to its proper conclusion. This version of the show is almost 10min shorter than our previous run at it, so I think our manner of attack this time was indeed for the best as the latter half of the show just whirls by you after the sluggish build the first half contains. And time might seem an odd judge, but it really does speak to how much better a handle the guys have of the language and the way they’re using it. Play went over FUNNIER than any of us anticipated – interested to see how the Saint John crowds react. And that’s not to say the show was a laugh a minute – although that’d only be 18 laughs! – but there were certainly some startled chuckles and giggles when the light first came up on us to reveal just our heads sticking out the top of the urns and all the make-up and oatmeal we applied. And then some key lines got laughs, but mostly on the first pass through the text. In the repeat most of the laughs were gone but the audience did seem taken by what was happening and professed as much afterwards from what we heard. The show, especially the repeat of the text, ended up feeling like we were a band jamming with the way we would listen to one another and react in some way accordingly. Just gotta say the IQ light we used in Mem Hall worked well and had a very mechanical overlord quality to its movements as you could hear the grind of the shifting with each move – added a nice creepy audio texture. Saint John will be more manual, but that too will have its own charm and character … looking forward to it. So Thursday night was solo work with Becky, and then last night started as solo work with Rebekah before Becky joined us later. When I had each of the girls alone we ran through the text per usual at first, but as if it were a monologue — i.e. so just W1 or W2 alone. Then I had W1 or W2 perform the text in a more melodramatic manner breaking all of Beckett’s directions and at first acting like they were speaking to either a sister or therapist in a confidential manner, and then as if they were at some kind of cocktail party holding court and telling this grand anecdote. Then I had each of them repeat the exercise but amp up the melodrama to make the role larger. We then returned to our Beckett-ian manner of delivery bottling all we’d learned inside of us. That was for the first section of the text, the “Affair”. For the “Aftermath” section, after running the lines in the proper manner, I had each of them on their feet being hounded by the light and playing out the anger from the lines towards the light, or again a level of comradery and confidence with the light, or perhaps a certain pleading or admitting attitude. We again returned to the Beckett-ian delivery with that experience bottled up. I thought it good to develop some sense of a “character” or “person” underneath these restrained heads in the urns. Then altogether tonight, after drilling the lines a number of times, we played a game where I’d sort of conduct the delivery of the text by pointing to one of four tempo/volume options: fast/loud; fast/quiet; slow/loud; slow/quiet. All of these exercise helped awaken the text a bit for all of us. It was becoming a little stale, I think in some sense. And part of the foundation the lines need is a life of some sort behind them so it was important for us to feel that physically and play with manner of delivery in all those various ways. Had a bit of an odd week, but ended up making some excellent strides with our work. The guys ran some lines and scenes by themselves on Tuesday night, and then on Wednesday night we just worked a few different mini-scenes or moments around the middle section of the play. And that’s what we did all night and it went quite well, I thought. Then on Thursday we begin the evening with similar work but focusing on the last few scenes of the play. And then we ran the play and it brought the house down for me! Sure, there were some rough spots which were expected considering it was 3 days or so since we last did a run and thus had last worked some of those scenes together. Tomorrow … err, I guess, today, we will start with working only on some of the earlier portions of the play, and then we’ll do a run when Annick arrives to step in as “the dumb waiter” so she can re-familiarize herself with the play, and of course so we can simply get a run of the show in as that is just going to make it snap more and more. But the run on Thursday night really showed me that the manner of approach we took this time is indeed paying off and yielding a more precise execution of the text. Play is … well, it’s hard. It’s hard to know how far to let either extreme go – strict adherence to “voices toneless … rapid tempo throughout” vs. loosening that in some regard. By loosening, I mean Beckett *had* to allow for some human variance in the future productions and deliveries of his text (otherwise he’d have banned any further productions of his work). I am more than willing to follow his stage directions but they also mean something differently to different people, don’t they. In an earlier post I noted that the “voices toneless” direction does not mean an absolute lack of emotion or investment in what we might call “character” – but this is where that fine line comes in about knowing which way to lean and how far. We are currently toying with variances in the 2nd pass through the text, that the repeat should contain these: slurring words/sounds; vocal volume variations; colouring of mild emotion, etc. The repeat has some leniency from Beckett in the text, with merely notations of what they did in London and Paris but not strictly stating these be the variations for the repeat so I am wrestling with how much screwing around we can allow in that 2nd pass. Another furtherance of this justification for the repeat containing potential variations of many types is that this is their 2nd and perhaps last time they will be able to say these things. While there is seemingly an indication that this world is a loop, we have the direction of how the delivery should go – strict adherence in the 1st pass on the text – and then allowance for variation on the repeat. In an essay I was reading the other day (and I’ll be damned if I can find it again – just spent 40min looking! ), the writer was making the case that even though it may *seem* like Beckett’s characters often appear to be stuck in a never ending loop that it is actually important to keep in mind that all we have is the text, which has a beginning and an ending, that Beckett is placing the audience in the same position as the protagonist(s) and thus we should actually assume that all these characters have is this time with the audience. And so, the repeat carries significant weight and thus throws heavy implications towards the nature of our variations. I’m going to do some isolated work with each of us this week – including myself! – where we will carve some of this out in the delivery of the text. We have been continuing on with pushing the underplay of the action. I wanted to try having the guys play more in the vein of stricter drama rather than the more melodramatic style we used last time. I was VERY happy with the outcome of our process when we last staged this, but with this 2nd kick at the can and having more confidence in myself as a director I felt we should and could trust the text more — i.e. last time I think I got hung up with trying to “do more” with the play than it necessarily required. I felt a need to try to show the audience the underlying dread or awkwardness or uncertainty, but this time we allowing the text — which is the lead in that regard — the text is stepping further to the fore and we are serving it more by this approach and I think it is extremely noticeable. Much like a slightly altered approach we took when staging MacIvor’s This Is A Play this past spring, it is not so much that this approach is necessarily even better but simply that it *seems* better this time through — we certainly couldn’t stage the *exact* same show and what would be the fun in that anyway, right? However, I do think we are falling more in line this time with the way Pinter would want things. Regardless, we ran most of the show today and it REALLY played extremely well with the frantic and uncertain nature of things bubbling to head later, after the first appearance of “the dumb waiter”. In some sense we started with the guys in too frantic a state of mind last time rather than letting it build over the show … I remember thinking they needed to already be there because the show is so short, but things to really go awry for them until the entrance of the “the dumb waiter”, after which nothing that happens or is said can carry a clean slate — it’s all tainted with suspicion of some sort. Great run today (or yesterday now) … excellent work on the “instructions” scene and the following “scampi” scene, with the former being one of the trickier and quicker line sections, and the latter being one of the more physical scenes of the play, if not the most. We have just to touch on the very ending of the show on Monday and we’ll be into runs and spot scene work … things are rolling nicely. We have a much shorter rehearsal time than I generally like to have, since we all have lives/work/etc outside the Nasty realm so I generally prefer a longer overall process to let pieces sink in a bit more over time before the real nitty gritty work gets started as it usually makes for a firmer foundation — we’re still working that foundation first, but I guess it’s just seemingly more hectic as a result of the limited time and doing two plays. But that’s the fun too, eh? And these are all quick and strong actors, so there’s nothing to worry about, just lots to do! Dumb rehearsal yesterday went better for me as I just got the guys to run the scenes, just saying the lines simply, with minimal intrusion from me — last week I was far too intrusive. And so, for the remainder of this week I’m just gonna have them run through working the rest of the show and all I’ll be basically doing is stopping and re-starting so we work smaller bits, as well as the odd blocking fix/change. Other than that, I’m gonna let them get more comfortable with the text again, so next week and the week leading to opening we can really have a more solid base … last week I was jumping the gun a bit and focusing on minutiae when we should have been casting more broad strokes. But we are focusing on doing less this time around, and trusting the text a little more (I’m reading a lot of David Mamet lately, so … ). Rehearsing Play is currently a very strict vocal exercise, and is creating for us something we will have no trouble molding and shaping — in as much as we are allowed when following the rather strict directions from Beckett (about which I had to sign a rider saying I would change NOTHING in the script! HA! No problem, but relax about it a bit, eh?) — with some of that more dramatic work hopefully starting before the end of this current week. The women are on top of their lines — more than me! — and it is going to be very cool to start the work of really structuring deliveries. Being in the show I’m always self-conscious about giving notes to my fellow actors, but I trust they know it’s in the spirit of doing the best for the work. And I hope to do this as more of a group exercise that is more led by me than monopolized by me — i.e. one of us perform our part for the others, and then the spectators offer feedback, etc. The decision to pick this work just sorta fell in my lap after a few attempts to get some other stuff off the ground. And well, I am glad we ended up in this script because this play is WACKED! HA! The end result really will be quite an intense experience for both performer and audience alike. To complicate this process a little further, I have thrown myself into the cast as well (see note about stopping/starting a couple of other things — this just became the easiest solution for me this time around since we are more pressed for rehearsal process time than I usually prefer). By way of explanation, let me just say that the staging for this play calls for each actor to be inside a 3 ft. tall urn, so only our heads are seen. There is no interaction between the actors as each urn faces front and a spotlight moves from each head invoking/demanding dialogue or response — this light is very much like an unseen/unknown 4th character in the role of some sort of interrogator, but also more than that since the 2nd half of the text finds the heads addressing the light directly rather than just spewing out lines in response to an interrogation (which is how the 1st half of the text works). Through this manner the details of a love triangle emerge. Beckett’s instructions to the actors calls for emotionless rapid fire delivery — these heads are no longer people, per say. And so, the process: We have begun by simply isolating “scenes” within the text and running those bits over and over, incessantly, and then moving to the next “scene”, and so on. Granted, it is a bit tedious but entirely necessary at this point and seems to be working nicely. We are developing a bit of a rhythm which is great because the entire piece is closer to a musical composition than a play, and the actors like instruments being used to simply “play” the text. CORRECTION: Above I say that Beckett instructs the actors to be “emotionless”, but that was a poor paraphrase on my part. The script actually says, “Faces impassive throughout. Voices toneless except where an expression is indicated. Rapid tempo throughout.” — so while “toneless” does imply a limit of emotion it does not denote an entire lack of emotion. As I was re-reading this after re-reading the stage directions again it occurred to me that this is an important distinction … or perhaps more importantly, a small window into the humanity of these “characters”.